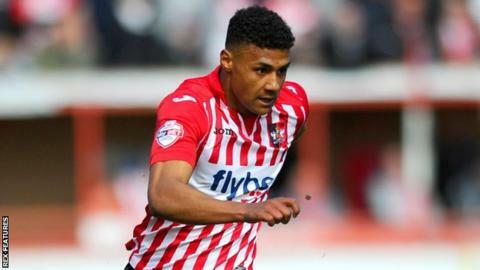 League Two Player of the Month Ollie Watkins' sensational stoppage-time winner saw Exeter City come from behind to beat Devon rivals Plymouth Argyle. After a cagey first half Jamille Matt gave Argyle the lead as he rammed in his third goal in as many games. Exeter drew level with their first shot on target when Watkins drilled a shot into the bottom corner from 20 yards. But he topped that effort by blasting a brilliant shot into the top corner from 25 yards out to seal the win. The victory saw Exeter do a league double over Plymouth for the first time since the 2013-14 season. Argyle drop out of the top three on goal difference after Bristol Rovers' comfortable 3-0 win over Crawley Town, while Exeter's hopes of making the play-offs stay alive as they move up to 10th place, two points off a spot in the top seven. Match ends, Exeter City 2, Plymouth Argyle 1. Second Half ends, Exeter City 2, Plymouth Argyle 1. Goal! Exeter City 2, Plymouth Argyle 1. Ollie Watkins (Exeter City) right footed shot from outside the box to the top right corner. Foul by Jamille Matt (Plymouth Argyle). Substitution, Plymouth Argyle. Craig Tanner replaces Graham Carey. Jake Taylor (Exeter City) is shown the yellow card. Jake Taylor (Exeter City) has gone down, but that's a dive. Goal! Exeter City 1, Plymouth Argyle 1. Ollie Watkins (Exeter City) left footed shot from outside the box to the bottom right corner. Corner, Plymouth Argyle. Conceded by Christian Ribeiro. Attempt saved. Jamille Matt (Plymouth Argyle) right footed shot from outside the box is saved in the bottom right corner. Attempt missed. Jake Taylor (Exeter City) right footed shot from outside the box is too high. Corner, Plymouth Argyle. Conceded by Robert Olejnik. Substitution, Exeter City. David Noble replaces Jamie McAllister. Attempt blocked. Jake Jervis (Plymouth Argyle) right footed shot from outside the box is blocked. Attempt missed. Peter Hartley (Plymouth Argyle) right footed shot from more than 35 yards misses to the right from a direct free kick. Jamille Matt (Plymouth Argyle) wins a free kick in the defensive half. Attempt missed. Ryan Harley (Exeter City) right footed shot from outside the box is high and wide to the right. Foul by Jordan Houghton (Plymouth Argyle). Attempt missed. Reuben Reid (Plymouth Argyle) header from the right side of the six yard box is close, but misses to the right. Goal! Exeter City 0, Plymouth Argyle 1. Jamille Matt (Plymouth Argyle) right footed shot from the centre of the box to the bottom right corner. Assisted by Reuben Reid. Second Half begins Exeter City 0, Plymouth Argyle 0. First Half ends, Exeter City 0, Plymouth Argyle 0.